Damaged (scraped) tire - what to do? First of all, I am either inexperienced or very lucky because I have never had a flat bike tire in my life. Now comes the question. I have no idea how long it has been like this or what is the cause (maybe a very sharp rock?). The cut/scrape is about 1 millimeter wide, 6-7 millimeter long and 3-4 millimeter deep (0.04x0.25x0.15 inches). It is clean of substantial debris but stays open like that when normally inflated at 115 Psi. What actions should I take? The tire is not flat and I am able to ride normally but should I be concerned? It does not look to me like the cords are damaged, which means the tire will still have its strength to hold the air pressure of the tube. Ignore it. It will probably last until the tire has no tread left. The cut itself will bulge a little, so this will be the point of failure of the tire. The bump may cause the tire to make noise of vibration as you ride- If you notice this the tire has little life left, or may quietly wear down till with the rest of the tire. Put a sleeve in. Get a piece of tough material like canvas (the side wall of an old MTB tire is great), insert it under the cut. This will provide a stronger area around the cut and prevent the weakness causing further problems and extend the life a little more as it will reduce the size of the bulge caused by the cut. Its a technique used as a temporary repair for tires to get you home, and works for tires with significant cuts (I have seen it used successfully on a MTB ride for a tire with a 2-3cm full thickness cut.) As we all know, there is nothing more permanent than a temporary fix that works. Replace the tire. A shredded tire on the road is really a pain. Unlike a puncture, which is generally repairable, the only fix is a new tire - do you carry a spare tire? Although I always carry a tube and repair kit, I only carry a spare tire for very long rides (and usually just one in our group will carry a spare). If I have a spare tire in good nick, why would I leave a dodgy tire on the bike? Pull the tire. Don't just clear it of substantial debris - clear it of all debris. If there is something in there it will work though the cords. If you are into the cord then still do not give up as that is a decent tire. From the inside if you can see damage to the cord then time to get a new tire. For me I get a new tire and save that as an emergency spare. Don't do an insert - that is just what you do to get home. It will shift and wear out a tube in no time at all. You don't need to be too worried about it. From my own preference in the past, if the tire plies are not exposed, tires with mere surface damages can still last a very long time. Rubber is sturdier than what most people think. 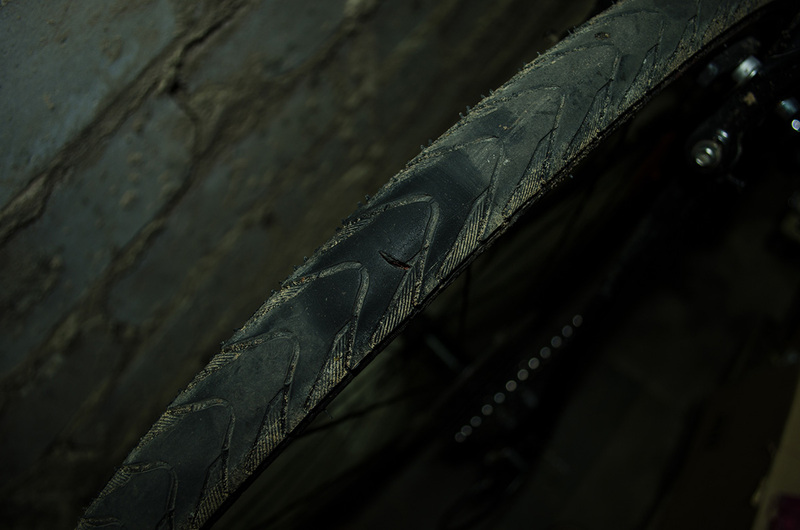 I ride a CX on MTB trails and get tires scuffed all the time. Especially if you are not doing anything intense (I assume because you ride a hybrid), this should not be a serious safety issue. It looks to me from the condition of the tread like you'll be replacing the tire pretty soon in any event. It might be possible to limp along like this a while longer, using a liner or such (I've used a dollar bill in a pinch for that), but what can happen is eventually the tube will poke through the tire and when that happens it wears quickly or pinches and "pop" you'll have a flat tire. I had that happen to my mt bike's tire when I was trying to get a few more miles out of a worn tire, but not a problem b/c I only use that mt bike on dirt trails, going slow up steep up hills, and always go very slow downhill. So it was at most an inconvenience. But if you were say to be riding on a paved road at 40 mph and the tire popped, well, then it might be more than an inconvenience. Buy a replacement tire. Not the answer you're looking for? Browse other questions tagged tire repair hybrid-bike damage or ask your own question. Does a hybrid truely have a wider tire or does a mountain have a wider tire? Damaged (bent) fork dropout - what are my options? Have I damaged my tyres?